Sunday Photo; weeds – Wake Up and Laugh! Weeds are the bane of fields, lust is the bane of mankind. Therefore, what is offered to those free of lust yields abundant fruit. Weeds are the bane of fields, hatred is the bane of mankind. Therefore, what is offered to those free of hatred yields abundant fruit. Weeds are the bane of fields, delusion is the bane of mankind. Therefore, what is offered to those free of delusion yields abundant fruit. Weeds are the bane of fields, desire is the bane of mankind. Therefore, what is offered to those free of desire yields abundant fruit. Thank you for this beautiful image. It looks even more compelling in large format. 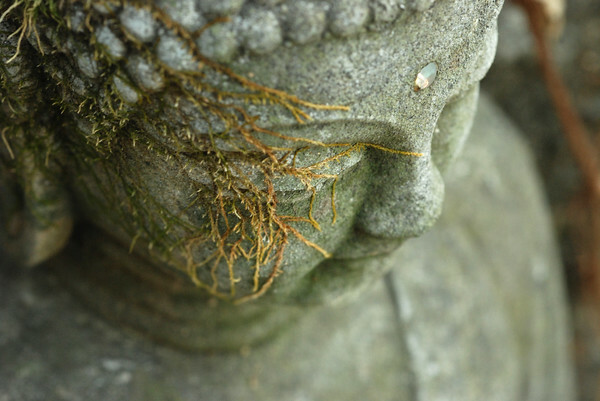 Especially enjoying the vine crawling across the Buddha’s face quietly whispering “impermanence,” the colors, and the great depth of field. I always really appreciate your feedback! Honestly, your photography blows me away! Let me know if you’d ever like to do a guest Sunday Photo. I think we’d all love to have you share something here! I came here from Reddit and am absolutely blown away by this image, along with others that you’ve taken. They capture the spirit. Beautiful–please continue with your work that, to me, captures thought and meaning beyond the realm of language. It usually takes a bit of courage to post on Reddit, even though lately I have regularly. I’m still overcoming a bit of apprehension about opening myself up the the online world. That said, the Reddit buddhist community there, thanks to people like yourself, have been pleasantly supportive. I hear you about the Reddit comments. Opening ourselves up to a community which is largely anonymous definitely takes courage! Thanks however for doing so, as we never would be able to appreciate your thoughts and pictures otherwise. Wow, this is a great match of teaching and imagery – both very clear! Thank you. an expressive meaningful picture, the buddha staying calm and aware inside and still outside. Have a nice peaceful day, Joseph!